Get ideas on selecting the right pool decking for your home. Visit several backyard pool decks to see why designer Scott Cohen chose concrete for the decking material. If your concrete pool deck is exposed to the hot sun all day, you can keep the surface cooler by coloring the concrete with lighter shades, such as sand, coral or pearly white tones. Avoid using stamp patterns with deep grout lines or rough surface textures, which can allow water to collect and be uncomfortable to walk on in bare feet. Set off your pool deck and add decorative interest by installing a pool border, or coping, in a contrasting color and pattern. Options include broom-finished concrete, limestone, concrete tile, and hand-scored concrete. Terrace the levels of your stamped concrete pool deck to provide separate zones for lounging and recreation. A titanium-white color scheme gives this stamped pool deck a distinctive look and “coolness factor,” making it comfortable to walk on even under the hot summer sun. In fact, the pool deck stays 20 degrees cooler than the adjacent limestone coping. The deck was poured with a white portland cement mix containing titanium dioxide. After it was stamped, the joints were filled with a white grout to create the white-on-white effect. 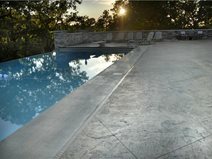 This beautiful concrete pool deck was stamped with a Roman slate seamless texture skin and colored with a combination of light and dark gray dry-shake color hardeners. It was also optimized for nocturnal enjoyment by incorporating multicolored LED lighting and sheer-descent waterfalls that put on a show after the sun goes down. When a swimming pool has a unique curvilinear shape, like this one, a great way to accent the curves is to install a curve-hugging border to match. 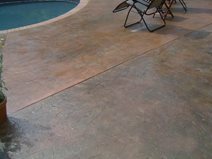 The concrete for the pool deck was integrally colored light beige, and then two colors of release agent (medium and dark brown) were applied to differentiate the border from the rest of the pool deck. The pattern used throughout is a sandstone slate seamless texture skin. A seamless slate pattern accented with a random leaf pattern gives this pool deck a walk-in-the woods allure. The autumnal color scheme was achieved by using integral terra cotta pigments, a terra cotta color hardener, and a charcoal release agent. A 6x6-foot diamond pattern stamped with a seamless stone texture skin gives this pool deck the look of hand-laid stone tile, accented by a broom-finished pool coping. The color is light wheat with shale gray accents.